From looking at the message boards and listening to sports talk, you'd think that Munson had already passed. So many folks speaking in such dark, depressing tones. Folks, Larry Munson is alive and looking to go out (professionally) on his own terms. Or pretty close to it. We should all be so lucky. We all knew this day was coming. He doesn't own a time machine, a fountain of youth or even a flux capacitor. He was going to retire at some point. The circumstances certainly aren't ideal, but it's manageable. We should be celebrating Larry Munson. The Echo Cheer (I have no idea what else to call it) is the back and forth call from the North Stands to the South Stands of "Georgia/Bulldogs." 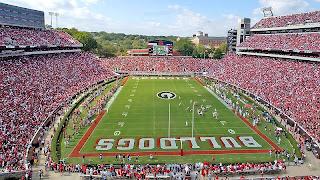 In my life, I've heard the stadium call only two things..."Georgia/Bulldogs" and "David/Pollack" (vs. Kentucky his last year). I never heard the legendary "Herschel/Walker" or "Terry/Hoage" back and forth calls. And I don't remember it ever happening for Zeier or Vince Dooley. But it should happen for Larry Munson. And it should be deafening. A round of applause and a long standing ovation just isn't going to cut it. We need a thunderous, multi-minute back and forth during each of the home games. It should be audible from other SEC venues. If you've got a contact with the cheerleaders....make this happen. And afterwards, if you want to enjoy that Victory Cigar, drink another cold one or smile at another co-ed, then all the better. I think Larry would be into that. To Larry Munson! The Bill Brasky of Announcers. Let's enjoy this last season together! ***The LarryFest Tour 2007 name is rancid bad. But I'm open to other suggestions. Drop 'em in the comments section. We have been blessed to have had such a legend. Even my Tennessee friends say that "hobnailed boot" was a genius of a call and my Clemson friends admit that Kevin did kick it 100,000 miles. One of my favorite memories was hearing Munson call an Atlanta Braves game in the mid '90's (a job he held full time in 1966). There will never be another like him. Let's enjoy the time we have left. Every game is a gift. paul, the ramblin "wreck" had some photos on live news last night, not sure if anyone tivod it. Agreed, celebrate and not morn. He is a first ballot HoFer. Anything he does from here on out, including going out on his turns, is gravy. I will always celebrate Munson. I cannot ever listen to any of his great calls without either laughing hysterically or crying uncontrollably or a little of both. He has marked so many great moments in my life. You are right. He ain't dead. And as far as I am concerned he never will be. Here's to Larry and young women and good cigars. All three eternal. All right on, PWD. Nice Brasky reference, too. yeah...you're right. I think I remeber now. Great post, PWD. As a Vol fan, I know the feeling of genuine loss when John Ward hung it up after 1998. Thankfully, his last call was the 1999 Fiesta Bowl national championship game. The replacement is never even comparable. While I certainly don't hope Uga wins the NC, I hope Larry has some great calls this year. Larry would hit that. So would we. Munson did hit that. All three, fool. Thanks for the iPod tip. However, I think there was a great call at the end of the 1997 Tech game, something about "snatching victory from the jaws of defeat". Does that sound familiar to anyone? I think Bobo led us in a great comeback. Does anyone have that call? The thought of the echo cheer, with 90,000+ working together gives me chills, and would be highly appropriate. I hope it happens. JasonC - i've been looking for that call everywhere for a couple years. Can't seem to find it anywhere. Perhaps someone out in DawgNation has it hidden somewhere, and can upload it to the intertubes. The sad thing is that I think I had it on my answering maching for a while, but I don't know where the tape is and it is on a mini-cassette. Here's the YouTube of the '97 Tech game, with Larry dubbed in. Good call on the LARRY - MUNSON cheer. It gave me goosebumps to think about it. Someone make this happen!